Swiss chard, along with kale, mustard greens and collard greens, is one of several leafy green vegetables often referred to as “greens”. It is a tall leafy green vegetable with a thick, crunchy stalk that comes in white, red or yellow with wide fan-like green leaves. Chard belongs to the same family as beets and spinach and shares a similar taste profile. Both the leaves and stalk of chard are edible. Chard packs a huge amount of vitamin A and it is naturally high in sodium. One cup contains 313 mg of sodium, which is very high for vegetables. 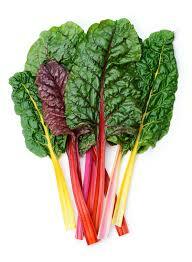 Chard is also surprisingly high in other minerals as well, i.e., calcium, iron, magnesium, phosphorus and potassium.